What they don’t necessarily deliver is a cheap morning routine. In response to the market opportunity for more affordable Nespresso compatible capsules, several companies have sprouted offering consumers alternatives to the name brand product. One such company is Gourmesso. Is their product worth your time? This is The Coffee Maven’s official Gourmesso review. 2 Where Does Gourmesso Get Their Coffee? 3 What Products Does Gourmesso Offer? Gourmesso is a Berlin-based company which sells Nespresso-compatible capsules for OriginalLine machines. 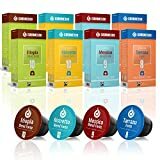 Whereas companies like HiLine Coffee Company were founded with the mission of giving you the best quality capsulized coffee, Gourmesso was formed to give you the most affordable capsulized coffee. As almost any owner of a single serve coffee machine will tell you, the cost of those pods and capsules starts to add up. Sure, it’s less expensive than paying $4 or $5 at Starbucks or your corner coffee shop, but a $15 one-pound bag of coffee beans will yield around 40 coffee servings at about $0.37 per serving. Whereas Nespresso brand capsules tend go to go for around $0.75 per serving, Gourmesso capsules typically cost around $0.50 per serving. Let’s look at the cost of Gourmesso capsules versus Nespresso. At $0.25 savings per capsule and one serving per day, that’s $91.25 in savings per year. Simply by switching to Gourmesso you can pay for your Nespresso machine in around a year and a half! But marketing yourself as “we’re the cheapest!” isn’t the most flattering of business models. While Gourmesso does note the affordability of their capsules, they really like to stress the variety of their product offerings. Where Does Gourmesso Get Their Coffee? Almost all of Gourmesso’s roasts are Arabica/Robusta blends, but they do have a couple that are 100% Arabica. In general, Arabica beans are superior to Robusta, but Gourmesso does this to keep their costs down. What Products Does Gourmesso Offer? Gourmesso specializes in Nespresso compatible capsules, but their products only are compatible with OriginalLine machines. This is due to the barcode scanning technology on Nespresso VertuoLine machines. Let’s take a minute to highlight each. Gourmesso offers 28 different espresso and lungo capsules. Most are blends from different countries, and most are Arabica/Robusta blends, but some are flavored/specialty roasts. For the complete list, check out our compilation of the 6 best alternatives to Nespresso capsules. We have a whole section there dedicated to Gourmesso. Tea lovers, rejoice! Gourmesso has you covered. They also offer bundles combining all 5! I’m an occasional tea drinker — I have a few cups per month — and actually enjoyed Gourmesso’s tea capsules. However, because Nespresso OriginalLine machines are set to brew a maximum 3.50 oz lungo size beverage, you need to use their easy custom size feature to produce the full serving size you’re looking for. That said, I really don’t know why anyone is using a Nespresso machine to make tea. It’s nice that Gourmesso thought of you tea drinkers out there, but just get some standard tea bags of your choice. Though they advertise accessories on their website, all they sell is a descaler for your Nespresso OriginalLine machine. That’s well and good, but their descaler isn’t any better than anyone else’s. 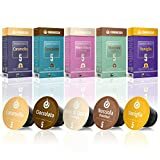 Gourmesso is an established retailer offering affordable alternatives to Nespresso’s more expensive capsules, and like all Nespresso compatible alternatives they’re only compatible with OriginalLine machines. If you want the best Nespresso compatible capsules and don’t mind paying upwards of $0.75 per serving, check out HiLine coffee. HiLine uses 100% Arabica beans — the best beans you can buy — and has a more freshly roasted product. But if your prime directive is to cut costs as much as possible, Gourmesso is a great choice. Very true. Nespresso tends to focus on quality and luxury – which means their products are much more expensive than counterparts from other brands. I’ve seen other companies provide Nespresso-compatible capsules but it’s nice to see one that focuses on the area. Is there much of a flavor difference? There really is a big difference in flavor. While I like HiLine Coffee’s pods a lot, that’s just my personal preference. Then again, I can taste the difference between freshly roasted coffee and staler roasts. Good question!